Manzanar National Historic Site invites visitors to participate in a weekend of special events in conjunction with the Manzanar Committee’s 49th annual pilgrimage. All are welcome and the events are free. Pilgrimage Weekend 2018 events begin Friday, April 27, with a public reception hosted by the Friends of Eastern California Museum from 4 to 6 p.m. The Eastern California Museum is located at 155 Grant St. in Independence. It features exhibits including Shiro and Mary Nomura’s Manzanar collection, the Anna and O.K. Kelly Gallery of Native American Life, and exhibits on other facets of local and regional history. Eastern California Museum is open daily from 10 a.m. to 5 p.m. The Manzanar National Historic Site Visitor Center is open 9 a.m. to 4:30 p.m. daily. On Saturday, April 28, only, the center will extend hours to 9 a.m. to 5:30 p.m. It features extensive exhibits and an award-winning film. A special art exhibit, “Looking Back, Seeing Ahead” by New Jersey artist Steve Cavallo, is on display through late May. 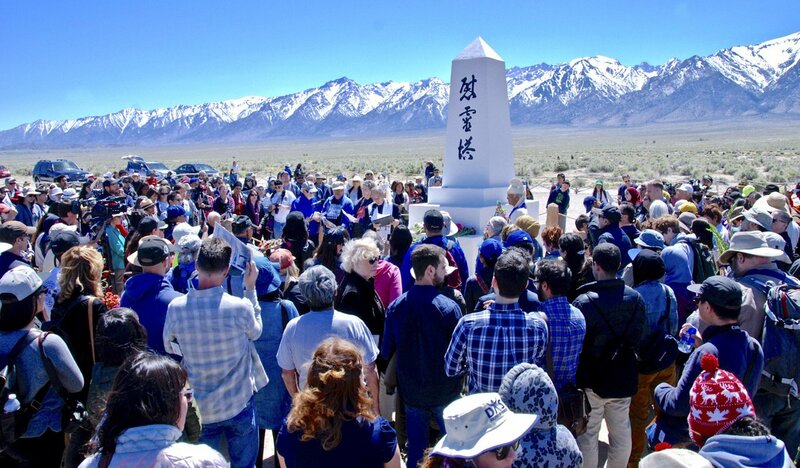 The pilgrimage ceremony begins at noon on April 28 at the Manzanar Cemetery. UCLA Kyodo Taiko will kick off the event with traditional drumming at 11:30 a.m., followed by the procession of camp banners at noon. The pilgrimage program concludes with the traditional interfaith service and ondo dancing, after which park rangers will offer walking tours to those wishing to explore Manzanar. The Manzanar At Dusk program begins at 5 p.m. Saturday at Lone Pine High School, located at 538 S. Main St. (Hwy. 395) in Lone Pine. The program offers participants opportunities for intergenerational discussions and sharing. The program is co-sponsored by the Nikkei Student Unions of Cal State Long Beach, Cal Poly Pomona, UCLA, and UC San Diego. At 11 a.m. on Sunday, April 29, “Life After Manzanar” authors Heather Lindquist and Naomi Hirahara will share stories from their newly published book in the West Theater of the Visitor Center. Manzanar History Association will host a book-signing after the program. With the exception of Friday evening’s reception and Saturday evening’s Manzanar At Dusk program, all events take place at Manzanar National Historic Site, located at 5001 Hwy. 395, six miles south of Independence, nine miles north of Lone Pine, and approximately 230 miles northeast of Los Angeles. There is no food service at Manzanar. Bring a water bottle, and lunch or snacks. Wear sunscreen, a hat, and comfortable shoes, and dress for the weather. For more information on Manzanar, call (760) 878-2194 ext. 3310 or visit www.nps.gov/manz. Additional pilgrimage program information is posted on the Manzanar Committee blog at https://blog.manzanarcommittee.org/.